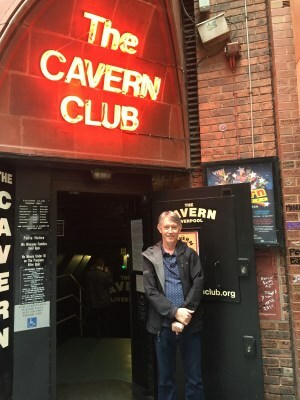 Pannell Discussions » 293 – Beatles tourism » Ideas in economics, environment, policy and more. 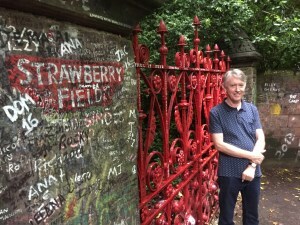 During our current holiday, Pauline gave me the opportunity to indulge in some serious Beatles tourism. I could have done this years ago, but felt reticent about giving in to the urge. This time I gave in to it, and I’m so glad I did. I have a passionate interest in music, and a tendency for my interests to become obsessions. These two things come together in my love of The Beatles. They are ideal fodder for an obsessive interest. As well as enjoying their amazing music, there is great scope for obsessively collecting their records and CDs, reading Beatles-related books and buying tacky memorabilia. It also helps that the story of their rise from obscurity and poverty to unprecedented fame and fortune is about as compelling and interesting as a story can be. Sure they had incredible talent and natural charisma, but to make it in the circumstances they faced required a whole series of million-to-one chances to come off, and every one of them did come off. It’s like a fairy story, but it really happened. Add to this their drive to innovate and their enormous influence on music and culture, and it’s no surprise that they still have so many people totally hooked. 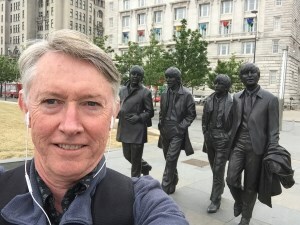 I spent several days in Liverpool seeing the sights and doing Beatles tours, Beatles shopping and Beatles museums. At one point, I had the most fantastic luck, as you’ll see. 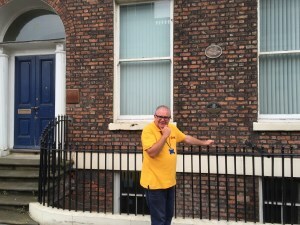 In addition, our travels prior to me reaching Liverpool took us to a number of important Beatles-related places, one planned and several by lucky coincidence. Here’s an overview of the highlights. There is an appendix below with lots more. 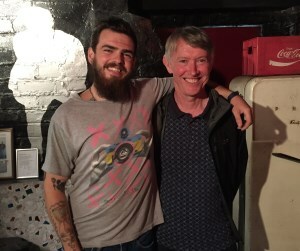 The greatest piece of luck was happening to bump into Colin Hanton, who was the drummer in The Quarrymen. This was the band formed by John Lennon in high school that eventually evolved into The Beatles. Colin appears in all the early photos of the Quarrymen, including this wonderful shot taken on 6 July 1957, from before Paul and George joined the band. Colin is sitting at the back, with his head near John’s elbow. He also played drums on the very first recordings by the band, in July 1958, when John, Paul, George, Colin and Duff (on piano) captured “That’ll Be The Day” and “In Spite of All The Danger” (the only original by McCartney and Harrison) on a record. You can hear these tracks on The Beatles’ album Anthology 1. Here, obviously, was a man who knew the young Beatles intimately (apart from Ringo). 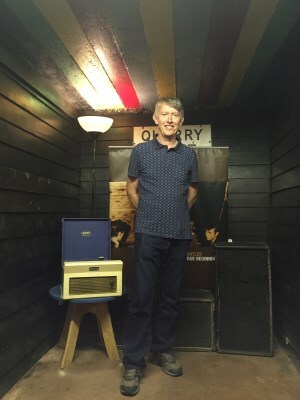 I was in a small shop in Penny Lane actually looking at a book about the Quarrymen, when my personal tour guide (Stevie T from Mop Top Tours) said, here comes Colin Hanton. I knew exactly who Colin was, so my heart leapt! 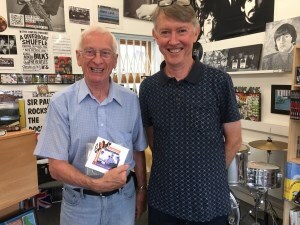 He came straight into the shop to talk to them about their stock of Quarrymen CDs. (They reformed in the 1990s, and still occasionally play and record). He was absolutely lovely, chatting, posing and signing the CD for me. I would have loved to ask him some probing questions about those early days, but my brain was buzzing too much to think straight. 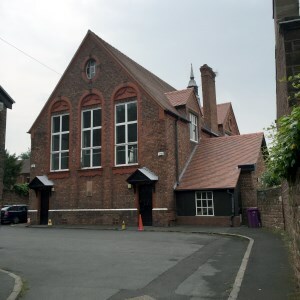 After that, the guide took me to the location of that photo of the Quarrymen, which also happens to be the place where John and Paul first met: St Peter’s Church in Woolton, where the Quarrymen played at the church’s annual garden fete. This was the most emotional point in the day for me. Here I am standing in what was then an open field but is now part of the church’s graveyard. The stage was set up in the back corner, near the blue tarpaulin in the photo. 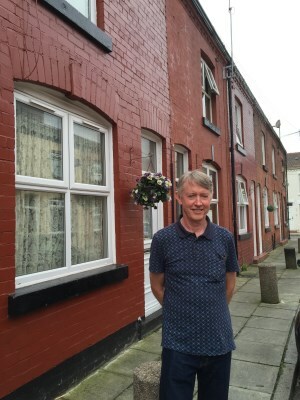 After Paul had seen the Quarrymen play, they all went over the road to the Church Hall, where the 16-year-old John was introduced to the 15-year-old Paul by their mutual friend Ivan Vaughan. Here is the hall, and me under the plaque that commemorates the meeting, trying not very successfully to hold it together. 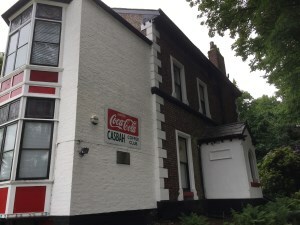 Later we went to The Casbah, a tiny club under a suburban house, where the Beatles played numerous shows between 1959 and 1961. They also helped to paint and decorate the place when it was first being set up, and their handiwork is still all over it. Paul painted the ceiling where I’m standing in the photo. This is the original stage area where they played their first Casbah shows, in a period when they had no drummer. Just as exciting as seeing this was the fact that the tour through the Casbah was presented by Roag Best Jr, and I got to meet Roag Best Sr. These two men have complex and multiple connections to the Beatles. Firstly, Mona Best, owner and manager of the Casbah, was their mother (Sr) or grandmother (Jr). Secondly, Pete Best, the Beatles’ drummer for two years from August 1960 to August 1962, prior to his sacking to bring in Ringo, is their half brother (Sr) or half uncle (Jr). 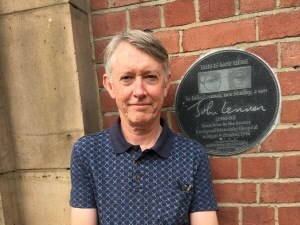 Thirdly, Roag Sr’s father and Roag Jr’s grandfather was Neil Aspinall, the Beatles’ right-hand-man, close friend, roadie, tour manager, and eventually the chief executive of the Beatles’ company. Despite serious tensions (and a legal case) over Pete’s sacking, the Best family maintained close connections to the Beatles, through Neil, right through the sixties and beyond. Here I am with Roag Best Jr. Behind us on the wall is a silhouette of John, painted by his then-girlfriend, later-wife, Cynthia. 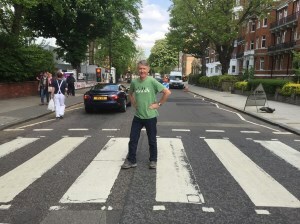 Finally, in this brief summary of highlights, while we were in London, I got Pauline to take a shot of me on the Abbey Road crosswalk, scene of the famous album cover. This was a bit tricky, as there were roadworks spoiling the view and creating traffic congestion, and there were lots of Beatles fans milling around and getting in the way of photos. We eventually got a picture that is not bad. All this was just incredibly exciting, and there was much, much more. If you’ve read this far, and you aren’t shaking your head in disbelief at my foolishness, you might like to check out the appendix, which shows almost all the Beatles-related things I saw, organised into chronological order (in terms of when the original events happened), fleshed out with a little bit of the relevant history. 1934, September 19. 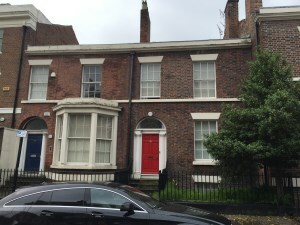 [birthplace] Below left is Rodney Street, Liverpool, where the Beatles’ manager Brian Epstein was born. 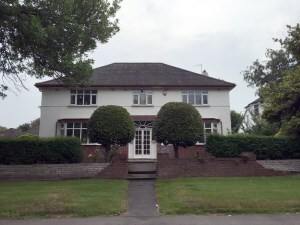 Right is his family home at 197 Queens Drive. Getting Brian as their manager was one of the million-to-one chances that came off for the Beatles: a man of high honesty and integrity in an industry where these were in very short supply. He was creative and artistic in nature, with wealth and connections, a love of their music and of them as people, and he was willing to put his all into managing The Beatles for their benefit and on their terms. They certainly would not have made it without him. The guy in the photo is my guide, Stevie T of Mop Top Tours, to whom I am hugely grateful for the great tour he provided. 1940, July 7. 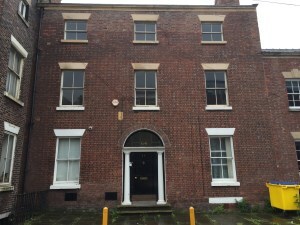 [birthplace] [home] 9 Madryn Street, Liverpool. 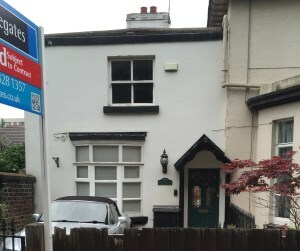 This is where Ringo Starr, the oldest Beatle by a few months, was born and lived his first few years with his parents and then just with his mum. Ringo was the most working-class of the four Beatles. This extremely basic home was scheduled to be demolished as the area is being redeveloped (you can see that it is shuttered), but after a public outcry the council decided to keep it and fix it up. 1940, October 9. 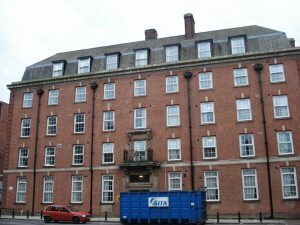 [birthplace] Liverpool Maternity Hospital, Oxford Street. John Lennon was born here on a day when, unusually, there was no German bombing. 1940-1945. 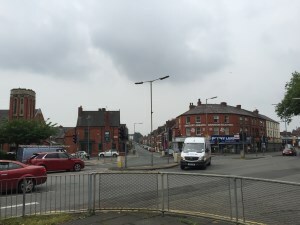 [home] Below left is 9 Newcastle Road, John’s first home, where he lived with his mother Julia and saw his merchant-seaman father Alfred rarely, until he and Julia split up. Alfred had no further contact with John until he was one of the four most famous people in the world. 1943, February 25. 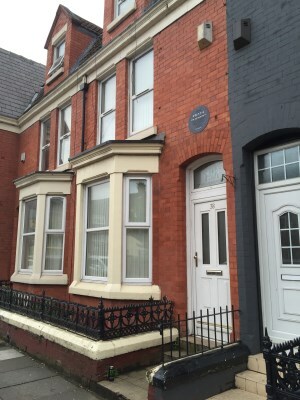 [birthplace] [home] Right is 12 Arnold Grove Liverpool, George Harrison’s birthplace and early home. It was about as basic a home as Ringo’s and had to accommodate a family of six. George was the only Beatle not to lose one or both parents, whether through death or abandonment. 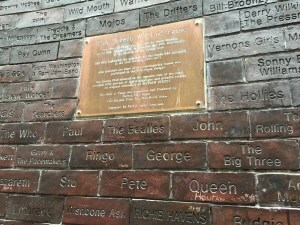 Of the Beatles’ birth places, only Paul’s has been lost; Walton Hospital was demolished in 2011. 1943, Spring. 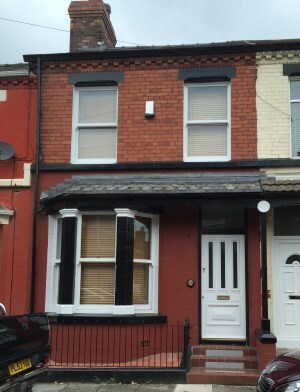 [home] “The Cottage” 120a Allerton Road. John and his parents lived here for a couple of months, probably the longest continuous time the three of them spent together. The house was owned by Julia’s sister Mimi and her husband George Smith. Uncle George was the only reliable male in John’s life and so was very important to him, especially once Julia’s wild and irresponsible behaviour prompted Mimi to take John in to live with her and George. Tragically, Uncle George died young, when John was only 14, the first of several of the people he most cared about to die over the next few years. 1945 [home] 10 Admiral Grove. Ringo’s second home. 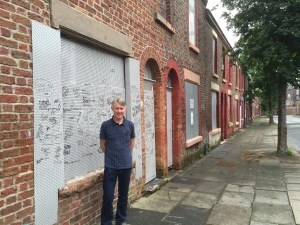 His mother Elsie moved them here when she could not meet the rent on 9 Madryn Street. They moved from one tiny run-down place to an even smaller and more run-down place a short walk away. Also shown is The Empress, the pub at the end of the street, where Elsie worked as a barmaid. The view we can see to the right of the pub is Admiral Grove, towards number 10. 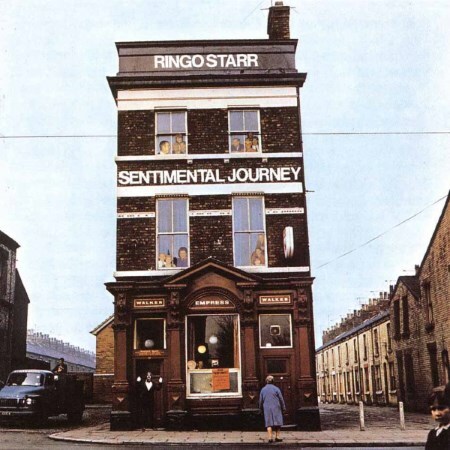 This hotel was used for the cover or Ringo’s first solo album in 1970, Sentimental Journey, on which he sang old-time songs that he probably learned from singalongs in this pub. Adding to the pain, Julia was killed in a road accident in 1958 just near Mendips, soon after John had re-established a relationship with her. 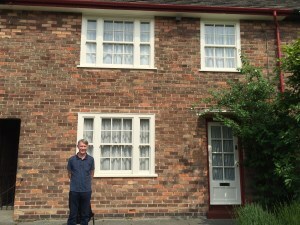 The house, together with Paul’s main childhood home, is now owned by the National Trust, which offers an excellent tour of both. Standing in John’s small bedroom (the window above the door) was a deeply, deeply moving experience. 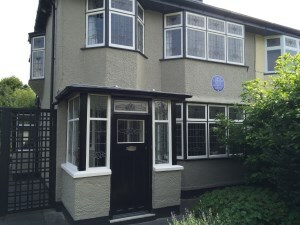 1955-1963 [home] The family home of Paul McCartney, at 20 Forthlin Road, was the location of early rehearsals and the composition of a number of Beatles songs. This too is owned by the National Trust and is part of their tour. Unlike John, Paul had a settled and loving childhood. However, his mum died of breast cancer soon after they moved to this house. The fact that they had both lost their mothers early became one of the important bonds between John and Paul. 1958. [place] Ye Cracke, a pub much frequented by John, Stuart Sutcliffe (who later became The Beatles’ original bass player), Cynthia Powell (John’s girlfriend and later wife) and other art students. 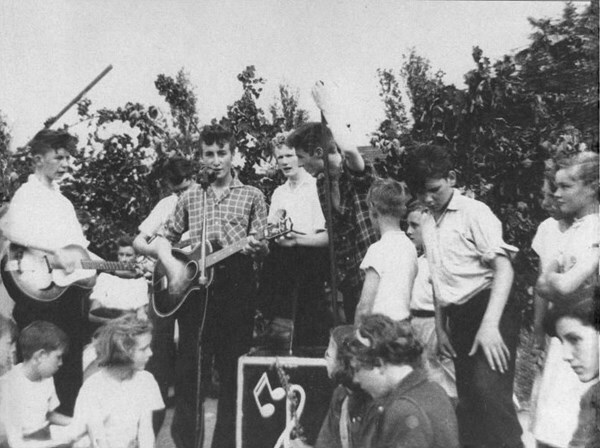 By early 1958, Paul and George had joined the Quarrymen and were playing with them in their occasional gigs. They were still school boys, but John had moved on to art college. None of them were model students, to put it mildly. 1958 and thereabouts. 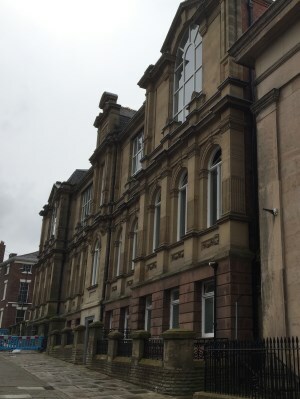 [place] On the left below is the Liverpool Institute, a grammar school for boys, attended by Paul McCartney, George Harrison and Neil Aspinall. 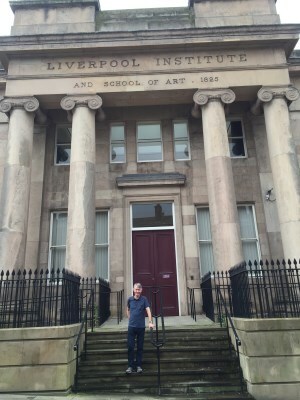 Right next door, was the Liverpool College of Art (right picture) attended by John Lennon, Stuart Sutcliffe and Cynthia Powell (later Lennon). Paul and George would sometimes skip school and hang out with John in the art collage. 1958, July and 1960, May. [studio] Semi-pro recording studio, run by Percy Phillips, at which the Quarrymen recorded “That’ll Be the Day” in 1958 and “One After 909” in 1960. Obviously it was just in Percy’s home. 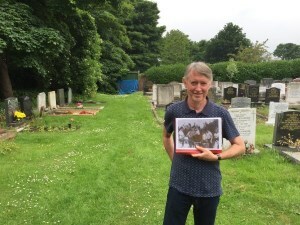 The mid 1958 recordings with Percy Phillips marked the end of the first phase of The Quarrymen. After that, Colin and Duff drifted away, leaving the core of John, Paul and George, three guitarists. Over the next couple of years they largely trod water, playing shows when they could but not really improving or progressing significantly. Other players came and went in the band, but John, Paul and George remained the core. 1959, August 28. [instrument] That’s the date John purchased a Hofner Club 40, his first good-quality guitar. It was bought just in time for their first gig at the Casbah. 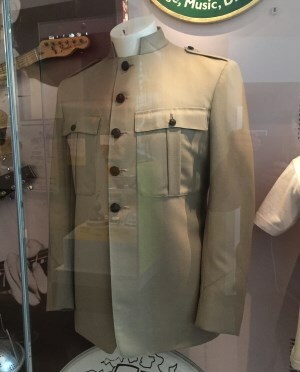 This replica is on display at The Beatles Story in Liverpool, a sort of museum that outlines and illustrates the Beatles history. 1959. [home] 3 Hayman’s Green. An outside shot of the home under which the Casbah was located. 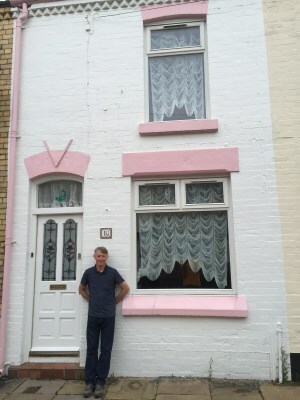 This was the home of Pete Best, Beatles drummer from mid 1960 to mid 1962. Pete’s is one of the more tragic stories in the Beatles saga. 1960. [home] Flat 3, Hillary Mansions, Gambier Terrace. 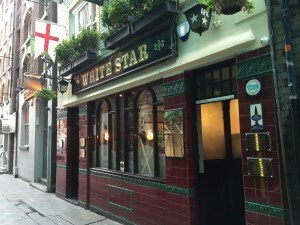 Home of Stu, then also of John and briefly of George. While Stu was living here he agreed to join The Beatles as their first dedicated bassist. Although he lacked notable musical talent, he did have the money to buy a bass! 1960, April 23. 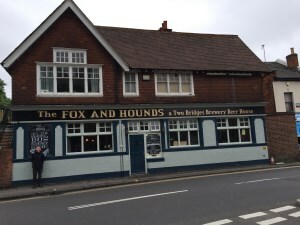 [venue] The Fox and Hounds pub in Caversham. We were well into our walk along the Thames before I realised that we would be walking right by Caversham (on the other side of the river to Reading). 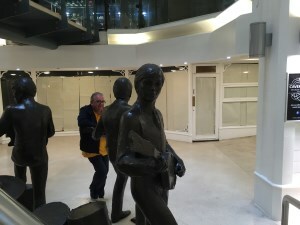 This raised the possibility of me visiting a special site in The Beatles’ history: the only place where John and Paul ever performed in public as a duo. They went by the name of the Nerk Twins (a Goon Show reference), playing to a handful of people in the bar. Only four months later, the band went to Hamburg and really got their kick start, but at this stage they were complete unknowns, getting a gig because the pub was run by Paul’s cousin. Unfortunately I couldn’t have a drink there as it was under renovation, but here is me out the front. 1960-1962. 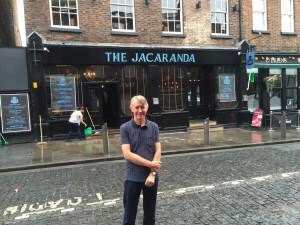 [venue] The Jacaranda (or the Jac) was a Liverpool coffee bar and music venue owned by Allan Williams, who played a crucial role in organising the Beatles’ first two trips to Hamburg. The Beatles would almost certainly never have made it without these Hamburg experiences to hone their performance skills. Williams had gone to Hamburg to check out the club scene there. He went into a club, the Kaiserkeller, and met its manager Bruno Koschmider. He tried to play Koschmider a tape of some Liverpool bands (not the Beatles) to persuade him to hire them, but the tape was kaput. Williams thought he’d blown in, but Koschmider was intrigued by Williams’ enthusiasm and later travelled to London to check out bands (he hadn’t realised Williams was from Liverpool). In one of the Beatles’ million-to-one chances that came off, Williams happened to be making a rare visit to London that same day with one of his Liverpool bands (Derry and the Seniors), and happened to go into the same coffee house as Koschmider. The band (the Seniors) did an audition on the spot, was hired and was a great success in Hamburg. In the wake of that success, Koschmider asked Williams to send another band, and the Beatles’ luck came through again. Williams offered the gig to all the main bands in Liverpool, none of whom could do it, for one reason or another. He was left with the only option being The Beatles, a pretty ordinary group with no drummer. They quickly appointed Pete Best as drummer (his audition was possibly in the Jac). Williams personally drove them to Hamburg, leaving from the Jac. 1960, November. John’s Club 40 guitar (shown above) was later used by Paul for a while (once John bought his first Rickenbacker in Hamburg), though being left-handed Paul had to restring it and play it upside down. Here it is in one of their most iconic photos. 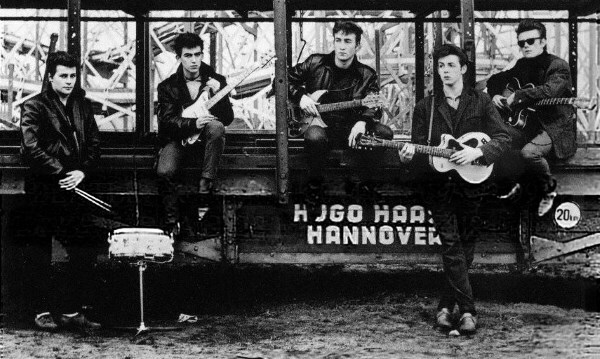 It’s from their first proper photo shoot, by Astrid Kirchherr in Hamburg, during that crucial first Hamburg trip. In Hamburg they played 7 or 8 hours per night, 6 nights per week. With such intense playing they rapidly and dramatically improved their musicianship, their repertoire and their stagecraft. At this stage they were a five-piece band (L-R, Pete Best, George Harrison, John Lennon, Paul McCartney, Stuart Sutcliffe). They were also very young. John had just turned 20 and the rest were teenagers, with George only 17 (he looks it!). A month after this photo, he was sent home for being under-age. Stuart left the band in 1961 to pursue a career in art, prompting Paul’s somewhat-reluctant switch to bass. Stuart died in 1962 from a brain haemorrhage. When The Beatles returned to Liverpool at the end of 1960, they were transformed and they quickly became the city’s biggest band. 1961-1962. 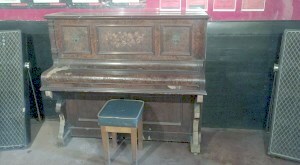 [instrument] The Casbah’s original piano (now stringless), which Roag says was played by The Beatles. It would have been played by Paul, who was the only one with any piano skills at that stage. Also in the picture are The Beatles’ PA speakers, which they left in the Casbah when they outgrew it. 1961-1963. 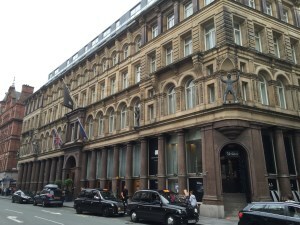 [venue] The Cavern Club at 10 Mathew Street. It became The Beatles’ home base in 1961 and 1962, with them playing there 292 times. There were just a few shows in 1963, when they were far too big to play such a small venue. 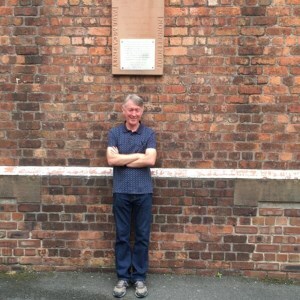 The Quarrymen also played there on 7 August 1957, before Paul or George had joined. The original Cavern was closed in 1973 and demolished to make way for an underground rail loop, which was never built. Decisions like that illustrate that, for a decade or so after the Beatles broke up in 1970, Liverpool didn’t sufficiently appreciate their importance, their tourism potential or the longevity of interest they would generate. 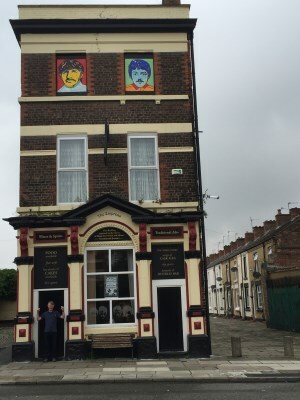 These days the stamp of the Beatles on Liverpool is huge and very obvious. The current Cavern is closely modelled on the original and about half of it overlaps with where the original was. 1961-1962. 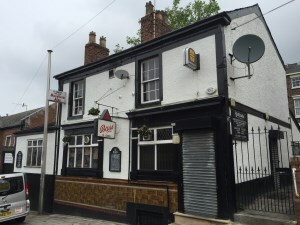 [place] Pubs in central Liverpool much used by The Beatles. 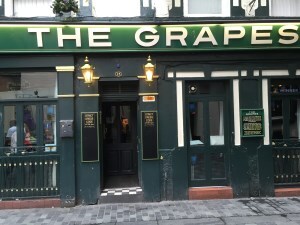 The Grapes, in particular, was their watering hole when they played in the Cavern. 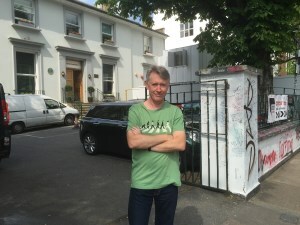 1962, June to 1970, Jan. [studio] EMI’s Abbey Road Studios in London, where The Beatles recorded almost all of their output. The way The Beatles’ recording contract with EMI came about was another million-to-one chance. They had already been rejected by every record label in England, including EMI. However, the EMI music publishing firm, Ardmore and Beechwood, was keen to sign up Lennon and McCartney as songwriters. (Through another series of unlikely events, Brian Epstein had been able to play them some of the Beatles’ early original songs.) Brian would not agree to a publishing contract unless it came with a recording contract. Unbeknown to Brian or the band, Ardmore and Beechwood put pressure on EMI to provide one, but they refused. Then, in a freak of luck for The Beatles, one of the heads in EMI got wind of the fact that one of his label managers, George Martin, was having an affair with his secretary. This head was a deeply moral man and was outraged. To show his displeasure, and to get the publishers off his back, he forced George to take on The Beatles. It took a while for the relationship to bed down, but within about six months they had established the most important producer-musician relationship in music history. Part of the incredible luck in the story was that it was George Martin, and no other producer, who ended up with The Beatles. Thank goodness they were rejected by all the other labels, or they would have ended up in a deal providing no artistic freedom, with little (and perhaps no) scope to record original songs, and probably limited to releasing singles, not albums, which was normal for pop stars at the time. Once he grasped their potential, Martin provided the perfect environment and musical support for them, making crucial contributions to some of their greatest music. 1962, August 23. [place] Below left is 64 Mount Pleasant, Liverpool. This was the registry office where John and Cynthia were married. The marriage was a rush job as Cyn was pregnant with Julian. 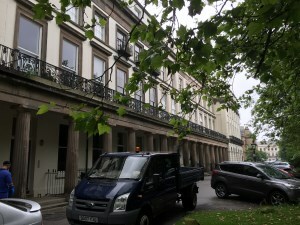 [home] On the right is the flat at 36 Falkner Street, Liverpool, owned by Brian Epstein, where John and Cynthia lived for a while following their marriage. Early 1963 [clothing] An early Beatles suit jacket worn by Ringo in 1963. I chanced upon this in the Victoria and Albert Museum in London. In early 1963 Ringo had only been in the band for a matter of months. Pete’s sacking to make way for Ringo was one of the most controversial episodes in their history. Ringo very quickly settled in and became part of an inseparable team with John, Paul and George, which Pete had never been. 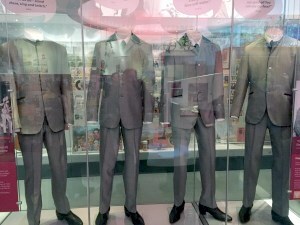 1963 [clothing] A non-matching set of Beatles’ suits. Two of them seem to be from the same set as Ringo’s jacket above. The other two have collarless jackets, which they used for a while in 1963. These are on display in the Museum of Liverpool, which is highly recommended, and not just because of their excellent Beatles displays. In the course of 1963, The Beatles went from being a little-known regional group with one minor hit to the biggest thing in British showbiz history. Their first album, Please Please Me, spent 30 weeks at number 1, and was only knocked off the top by their second album, With The Beatles, which stayed there for a further 21 weeks. 1963, August [instrument] Maton Guitar used by George in August 1963 while his usual Gretsch was being repaired. Four months later, Capitol released “I Want To Hold Your Hand” in the US, and the American music industry was shaken to its foundations. Previously, British acts were almost completely ignored, but in the first four months of 1964, over half of all records sold in the US were by The Beatles. After that, British acts had a period of remarkable dominance, and the impact of British music remains hugely disproportional to their population. 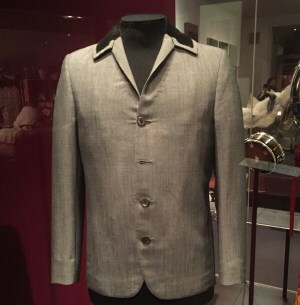 1965 [clothing] Stage suit jacket of John Lennon, worn on the 1965 American tour. This included the momentous show at Shea Stadium, the very first stadium music concert. Displayed at The Museum of Liverpool. By 1966, The Beatles were thoroughly sick of the mad hysteria that accompanied their concerts, so they quit touring, but they entered a period of unprecedented creativity and innovation in the recording studio and in their song writing. The next three songs epitomise this new phase. 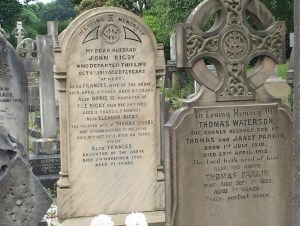 1966 [song reference] The gravestone for Eleanor Rigby at St Peter’s Church, Woolton, where John and Paul first met. Paul says he was unaware of this gravestone and made up the name, which makes it an amazing coincidence. 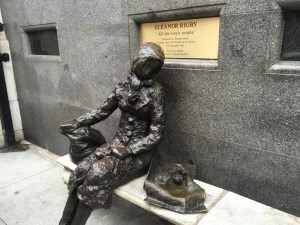 Also here is a statue of Eleanor Rigby, inspired by the song, created by the singer Tommy Steele and displayed in central Liverpool. 1967 [song reference] “Strawberry Fields Forever” is my favourite song by The Beatles, or indeed by anyone. Its beauty combined with its awesome complexity, coupled with the amazing story of how it was created, are irresistible. Here is the gate to Strawberry Field, the Salvation Army children’s home close to John Lennon’s childhood home, Mendips. John attended an annual garden party here, and his young gang of friends jumped the wall to hang out there at other times too. These gates are almost all that is left of the original place. 1967 [song reference] The actual barber shop referred to in Penny Lane. 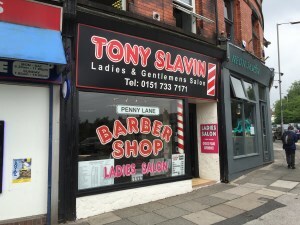 “In Penny Lane there is a barber showing photographs …” On the right is Penny Lane itself, this photo taken from the “shelter in the middle of a roundabout”. “Penny Lane” is one of Paul’s most ingenious compositions, with numerous key changes that sound completely natural within the song. Most people don’t even realise they are happening. I’ve recorded a version of it, arranged for voices only, in four-part harmony. Hear it here. Fancy putting both of these incredible songs (“Strawberry Fields Forever” and “Penny Lane”) onto the same single. Such was their wealth of material. 1967. 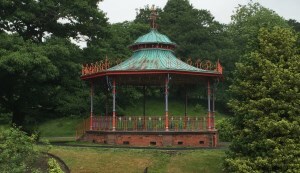 [place] A lovely old bandstand in Sefton Park that is thought to have been part of Paul’s inspiration for Sgt Pepper. In 1968 they released my absolute favourite album, a highly eclectic double album set, officially known as The Beatles but universally referred to as the White Album. 1969, May 26 [place] We made a quick visit to Montreal early in our trip. 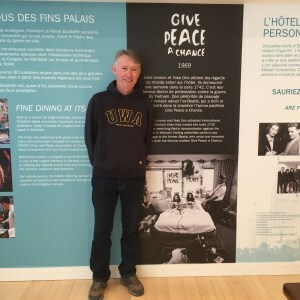 This was a chance to see the hotel that John and Yoko used to stage their Bed-In for Peace, and also recorded the song “Give Peace a Chance”. 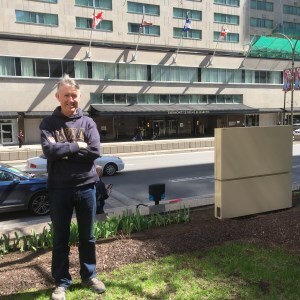 Here I am in front of the very posh Fairmont Le Reine Elizabeth Hotel (in 1969 it was called the Queen Elizabeth Hotel), and also inside it in front of a display that commemorates the event. By early 1970 it was all over. It’s quite understandable that they were ready for a change after all they’d achieved and been through together. Unfortunately the end was dominated by disputes amongst them over business decisions, mostly between Paul and the other three. History showed that Paul was completely right, especially about the undesirability and untrustworthiness of Allan Klein, who the others wanted to appoint as the band’s manager. 1970-2001. [home] Pauline booked the accommodation for our long walk along the Thames (see PD292), and she had no idea that the place she had chosen in Henley-on-Thames was about 50m from the front gates of George Harrison’s mansion, Friar Park. He bought this eccentric 19th century construction in 1970, saving it from demolition. This is just the front gate, with the gate house behind it. The actual house, not visible from the gate, is enormous, with 120 rooms. The contrast with the home he was born in could not be more extreme. 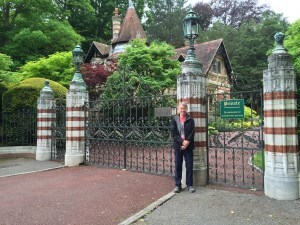 His widow Olivia still lives in Friar Park. 1970. 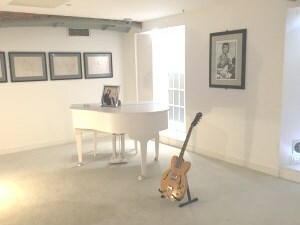 [instrument] [home] Below left is a reconstruction of the White Room in John’s London home, Tittenhurst Park, where he wrote “Imagine”. This reconstruction is at The Beatles Story in Liverpool. 1975ish (year not specified in the display). 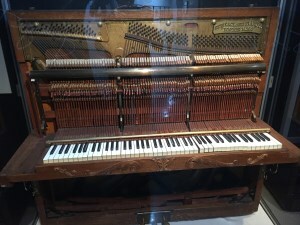 [instrument] Below right is a piano used by John Lennon in a New York recording studio. It may have been Record Plant, which he used for several albums, or the Hit Factory – I can’t recall. 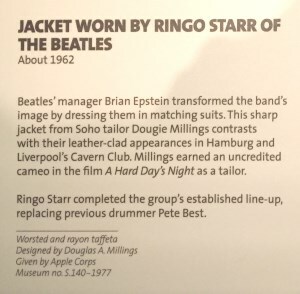 This is displayed in The Beatles Story. 2001 [place] They named the Liverpool airport after John in 2001. 2012 and 2007. 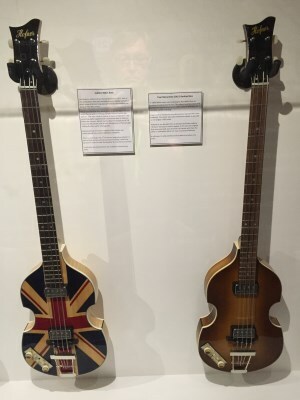 [instrument] These are two backup bass guitars built specially for Paul by Hofner. The left one was for the Queen’s Diamond Jubilee concert in 2012, and the right was commissioned by Paul as a backup for concerts in 2007. 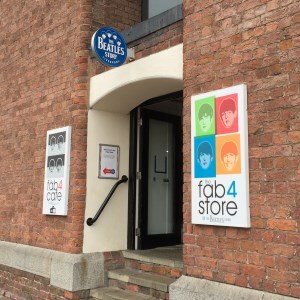 2016 [tourism] Two of the many commercial enterprises that serve Beatles tourism in Liverpool. 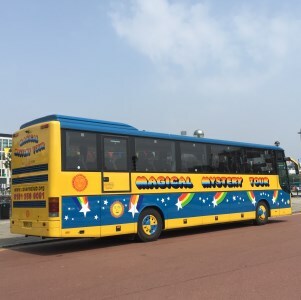 Researchers at the University of Liverpool estimated that Beatles-related tourism generates around £82 million revenue per year in Liverpool and keeps 2300 people employed. To finish with, here are various statues and memorials to the Beatles in Liverpool. In order, they are: (a) The latest statues unveiled only 6 months ago, at the Liverpool Docks. These are really good likenesses. (b) A set of more impressionistic statues below Mathew Street, at about the point where the original Cavern stage was. (c) The Cavern Wall of Fame, listing all the bands who played in the club in its original phase. 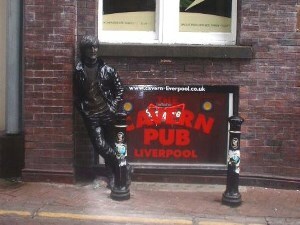 (d) John Lennon Statue in Mathew Street, next to the Cavern Wall of Fame (e) The Hard Day’s Night Hotel, which has a statue of each Beatle spread across its front at the first floor level. (f) Another memorial in Mathew Street. 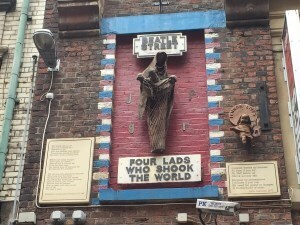 “Four lads who shook the world” sums things up rather well. Lewisohn, M. (2013). Tune In: The Beatles – All These Years, Vol. 1, Little Brown, London. Pannell, D.J. (2004). The White Album, Pannell Discussions #10. Pannell, D.J. (2012). It was 50 years ago today, Pannell Discussions #225. Pannell, D.J. (2014). Capitol Records’ shameful handling of The Beatles, Pannell Discussions #264. Posted on 20 June, 2016 by David Pannell. This entry was posted in Music. I had no idea that would be a problem for anyone. What’s the issue? Finally! I was wondering when you were ever going to indulge in the urge! Goodonya! I’m so glad you did! And some great pictures too! I’ve created a special file for this… Above all, Dave, thanks for sharing so nicely. It allows me to indulge a bit too, at lower cost! So make the most of it and when you get back, show us pictures and, perhaps, let us hear the sounds. I am so envious! Great story and photos. Great to see you having such a good time, Dave!